It is the year 2017, and Europe is being invaded by the forces of the Holy Britannian Empire. In an attempt to combat the opposition's overwhelming pressure and put an end to the massive casualties, the army forms a special unit called Wyvern, or W-0, composed of former Japanese citizens referred to as "Elevens." Recruited from ghettos, these young men and women pilot Knightmare frames—humanoid war machines—into dangerous operations where death awaits, hoping to make a name for themselves. The first episode was pre-aired on July 16 and officially released to theaters on August 4, 2012. September 7 2012 update: For the past few weeks, I have gotten countless messages asking me how I saw this movie online. If you look at my profile, it clearly says I live in Japan and it is easy to conclude that by living in Japan, I have instant access to anime releases whether DVD release or theater showing. So far I have only watched the first episode and will expand upon this review as more episodes are released. This movie takes place within the timeline of the series . Despite that, at this point, I don't think any familiarity with the TV series is 95% at all necessary to get into this. References to events in the TV series are not at all referenced to. But due to the distinct geo-political geography of the world of Code Geass it would help a lot. If you watch this without any exposure, you will have some trouble putting some things into perspective in that context. But what is also great is that this movie/oav series touches upon something that wasn't really touched upon in the TV series in that much elaborate detail to begin with which was the EU. The movie starts by briefly summarizing that in 2010CE, the Holy Britannian Empire invaded Japan, took over in a month, and renamed it Area 11. Then it cuts to what is going on in Europe, or EU, one of three super powers along with Britannia and the Chinese Federation. The story centers around two characters, Reira and Akito, two junior officers in the EU. Reira is a command room officer who gives the orders type while Akito is an exiled Japanese knightmare pilot who happens to have elite skills and together, they are fighting the complications that surround them. The reason why this series is distinct from the original TV series not because of the setting, but because of these characters. The characters are very different from the cast and will make it easier for newcomers who no experience with the TV series to ease into. But I felt Akito and Reira lacked the charms of the original cast and don't feel any distinct from any other standard mech character. Akito to me is very cliched and stereotypical mech pilot for most of the movie. No, he's not the whiny type, but he is the quiet and anti-social homocidial type. For most of the movie, he is a mystery and hard to relate to and understand. By the time the first episode ends, they really start to flesh out his character. The only praise I can give Akito as a character in episode 1 is that he is super ballsy and will take wicked risks to get his mission done. Reira is strong, but she still lacks experience and understanding. By the time the movie ends, you do feel that these characters do have potential to grow and develop. The movie also shows that after 2010CE, the Japanese also struggeled trying to live outside of Japan and were also discriminated against in the EU as well. Even though this was briefly touched upon in the movie for just a brief moment, I felt those scenes really stood out since you have a better idea of how the Japanese were not suffering not just inside in Japan, but all over the world as well, and how far some individuals were willing to go for their freedom. Also, Akito will have problems with other people because of his ethnic background. The art is still in consistent to the TV series designs. The Britannian uniforms still appropriately reflect French and British imperial culture while the EU uniforms had something of a Nazi feel to it with the pants, the coats, the ties, and the hats. It's very hard to tell who is the bad guy in my opinion due to these particular designs. What really shines here are the mech battles. In the TV series, the mech battles were more secondary, while the mech battles are more of the highlight. They are well grounded, strategic, violent, exciting and balls to the walls. I say in terms of action, I say it is equal to the quality of Gundam 08th MS Team so far. The environment equally captures a futuristic look and at the same time also keeps in tune with the European background. You will see traditional French buildings like the Eifell Tower and the Arc De Triumph and the construction is excellent as well. The music works well with the intensity and the dark mood, but isn't really as explosive as the TV series with songs like Colors. I got no complaints about the voice acting. All the actors do a good job of capturing their characters. I don't have any familiraity with Akito's voice actor but he does a good job of being homocidal and anti-social and secretivie all at the same time. In the end, it is just a first episode. It is introducing things and the trailer shows a lot of promise that things will be expanded upon and will be in for a few surprises. I think as a first episode, it is ok and should be open to anybody whether you're a fan or not. At this point, this Code Geass feels more like a mech anime as a opposed to a political thriller like the TV series. I felt what made Code Geass attractive to me wasn't really that well present in this installment so far but as a fan of mech, it pleases me enough. 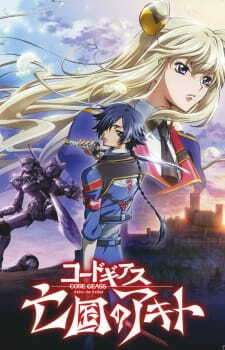 This is my First review on MAL so I decided to review the latest Code Geass. This is the first episode of a 4 part movies spin-offs based on the Code Geass series and so far it shows that it is a very promising spin-off that will hopfully do the Code Geass franchise justice. The animation in this anime is just pure gorgeous eye candy by far exceeding that of the original series, the CGI animation in the mech battles are just incredible, the mecha’s truly feel like metal clashing together and the camera angles give an amazing presentation of balls to the walls violence while still strategic just like you expect from Code Geass. The art also does an incredible job presenting a futuristic look while still holding a certain European culture around it. Overall the animation is just flawless. Despite that this is a spin-off, you don’t actually have to watch the main series to follow it. It is very well explained how the brittanian empire has taken over Japan renaming it as the colony area 11 and how the empire is now at warr with the E.U, what this anime does a great job at presenting is how the E.U is nothing better than the brittanian empire. Even there Eleven’s are being discriminated and stuggle to life there, the hierarchy between the Europeans and elevens is very well presented and a great starting point to build up. So overall the story and presentation are very well managed and easy to get into. This is where I feel this spin-off is very lacking in, the code geass series is very well known for it’s extremely iconic and indepth characters from Lelouch, Suzaku, Kallen to Jeremiah, Euphie and Anya. Most of the characters in Akito the Exiled just lack the charisma that the original cast had, especially Akito for that matter. While Lelouch was an extremely deep and charismatic individual Akito barely seems to have any kind of personality, he feels like a very cliché strong but silent type character, Reira doesn’t really feel that unique either and rather just…standard. However considering this was still the first part I am pretty sure that there will be a lot of character development in the future episodes especially for Akito because despite Akito being a character without personality he has something psychological and suicidal behind him that could be interesting to build up on in the future. The characters I did really enjoy tho where the three anarchistic elevens Ryo, Ayano and Yukiya. Especially Yukiya is my favorite character so far, a very devious, sly and intelligent villain. This anime is a good first impression for future episodes, the animation is beautifull, the storyline is very well presented and it overall looks like a spin-off that can match the series, however I am very disappointed with the lackluster characters and hope that they get more development in the future. As some of you may already know, I'm a big fan of Code Geass: Lelouch of the Rebellion. Season 1 remains my favorite television series to date, and R2 was still pretty fun and equally ambitious. You can imagine how intrigued I was when I heard that it got a sub-series that was meant to explore some new territory in the lore of the franchise. After all, there is so much we don't know, like the origins of geass or what exactly happened between the 1-year gap between the events of R1 and R2, or even delving into the EU, which was never actually shown in the main series. Unfortunately, as you will see throughout this review, I was disappointed by it, in part due to one reason: Akito the Exiled has no ambition. This film has no drive. It simply feels like an addition to a franchise rather than a brand new installment that explores uncharted territory. Whether or not you liked the original series, you have to admit that it had a lot of ambition. It tried to be fun, humorous, and nuanced at the same time, and it balanced each part well. Whether or not you think the attempt worked is up to interpretation. This doesn't have that, and it shows given how boring this slop is. If there's anything I can compliment about Akito, it's that it treats the franchise with respect. It never does anything to jeopardize the continuity of the main series, and it expands on one key thing I wanted to know about: the EU. Also, the first half doesn't have many story issues. Simply, after a battle in which the only survivor is Akito, he needs up with one of his superiors, Leila (the one in charge of her main crew and the operation), and they head to a party in which he threatens a scumbag who was mistreating the one he is meant to guard (Lelia). Little goes on here aside from an action scene but that's alright; it's just the first 24 minutes. The second half is what really killed the story. There’s this rebel trio who blows up their douchey superiors for seemingly no reason. I mean it, we don't know why they did that aside from possibly not wanting to take orders. Then, they attack or protagonists for seemingly no reason. Did they believe they were defenseless officials? Did they know those guys were armed and ready? We sure don't know what was going through their heads. They get captured by Leila (she never explains why she spared them), and then a guy killing his boss and potentially becoming an antagonist in the future. He grasses him, but we don't know what it does aside from the boss killing himself afterward. The lines of taking a trip don't help matters either. We end on Akito being edgy and saying “I died once” and that's a wrap. I know you can't really get much out of 50 minutes, no can you always put a lot into it, especially when it's introductory, but that's hardly an excuse for what happened here. Let’s start with Leila since she’s the first MC we see. She's a bland “righteous princess and poor people activist” archetype that happens to know some self-defense techniques. Conversely, Akito is surprisingly malevolent, even by Code Geass standards, with his first scene showing him in a bloodthirsty rampage and many subsequent scenes having him sport the most wicked of evil grins. Other than that, he’s pretty standard, and the last scene really paints him as edgy. Neither of these two really have much to them, but they're better than the other characters who are literally archetypes as nothing else, like Leila’s older “brother” or the geass guy towards the end who makes his master kill himself. There’s also the heavily enteric rebel trio who apparently want a place to belong, but their actions are clearly not indicative of that. What a dimensionless bunch. As for the character art, while it is missing the shine that the characters in the original do, making these guys more akin to what comes out of Light Novels, their designs feel strictly “Code Geass” with the even more exaggerated version of the already exaggerative CLAMP style. Unfortunately, unless someone is disarming someone hand-to-hand, don't expect much to any movement with these characters. The most you'll usually get is a little bit of walking. Calling this animated is a formality at this point, at least for the characters. Now for the elephant in the room: the CGI. The CGI Knightmares tend to look terrible here, and are equally poor in terms of integration; some of the background vehicles aren't an exception either. The mecha designs mostly remain the same, but the new ones from the first battle are awful, especially the eyes that make the Knightmare that Akito pilots look non-threatening. I appreciate the detail that went into the mechs of the first battle, but it doesn't work that well. The mechs in the second battle look like they were ripped from a cel-shaded GameCube game from 2003, and it is also poorly integrated, chief among them being what one of the rebels fights to take out most of the soldiers surrounding Leila before Akito steps in. The CGI explosions look hideous as well. Hopefully, the subsequent films improve the CGI integration and Knightmare designs. The directing in this film is also pretty terrible, especially for the action scenes. The camera looks like it was operated by a schizophrenic cameraman, which makes it difficult to process what's going on at times. Even outside of battle, sometimes the camera doesn't keep up that well, notably in one instance in the beginning before we heard back to the first battle. However, I do like the cockpit screens. Still, all in all, whenever there is actual animation, it's done with poorly integrated CGI mechs that we can't properly see fighting due to the camera, unlike in the original series. In fact, you'd think they'd be able to make even better fights on a 50-minute film than on a 25 episode television series (applied to either season of Geass) but I guess not. The music was not done by Kotaro Nakagawa this time around, and it honestly shows. Someone else was in charge, and while the music does feel reminiscent of the feel of the amazing tracks of the main series, it's shockingly bland. There's this one piece with the crazy trumpets used in an action scene, but it doesn't fit well at all with either the action of the scene or the atmosphere surrounding it. The ED theme is also pretty bland, but EDs aren't really the franchise’s strong suit, unlike the OPs and OSTs, so I guess that's to be expected. Ultimately, this was an unremarkable and poorly executed project, and I desperately hope this sub-series doesn't get much worse. Its characters are as dull and lifeless as its narrative, the action is terribly handled, and overall I'm left without a reason to care. Say what you will about the original series (and I have), but it always tried its damnedest to give you a reason to be engaged, whilst this right here is the epitome, nay, the embodiment of being sub-par! Did the movie improve on the original series? is Akito a better protagonist then lelouch? And who would i rather marry, Leila or C.C? Will i find more stupid clickbait-questions? I probably could, but let's start by saying that yes, Akito the exiled does indeed improve on some aspects and gets weaker in some others. Story: The story is not much worth mentioning, at least in this first installment. These 50 minutes are mostly spend on setting up the plot, the characters, introductions and the sort and then it ends pretty abruptly. That said, it was still interesting to me, seeing the conflict that takes place in Europe, something that was only mentioned in the show. But again, not much happens, first there is a fight, then we get introduced to our main characters, they meet and in the end we get a glimpse of our main antagonist. It's a set up for the next movies. I guess i liked it, it was good, so it gets a 7. Art: Now here is something to be said. I think, as is tradition for a movie, the art improved. Not only the quality in general, but also the style. The characters don't look quite that ridiculous anymore, but it's still visibly "Clamp". Leila looks amazing, jesus! Then on the other hand, all the mechs are suddenly CGI. That is a weird one, especially since they move a little odd and look generally not as good as the drawn mechs. The upside however: The fights are amazing, so fast-paced and full of energy, they always grabbed my full attention. I really look forward to see more of that. I really can't give the art section a poor score this time, it think it's very good at least, which is a huge improvement to lelouchs rebellion. Sound: Also slightly improved, though to be fair, the ost didn't really stand out to me. I mean, it's still better then the show-soundtrack, that one actually annoyed me from time to time. However, it had it's great moments, while the Akito one is kinda just...there. Same goes for the ending-song, didn't resonate with me at all, but i also didn't mind it. I'll give it a five, nothing note-worthy. Character: As i said, the movie is a set-up, the same goes for the characters. We don't really learn all that much about them. There is the title-character, Akito, who is a really cool guy with a dark past. You probably know the trope, i just want to avoid calling him edgy, cause this is just a meme by now. But yeah, pretty much that. He is also a little crazy, but they didn't delve into that too much yet. Leila, the female lead, is great however. Very attractive, very smart and can absolutely hold her own with some martial arts. Definitely my favorite one so far. Other then that we have three thugs and they are all pretty generic so far, the tough leader, the cocky smart guy and the beautiful, female assassin/ninja. The antagonist is a samurai, at least he looks like one and he is stone cold, not much more is known yet. They are other supporting characters, but they didn't do anything noteworthy as of now. The characters are good, Leila adds a whole point, i'll be honest. Enjoyment: I enjoyed it, the time flew by, though i did space out from time to time, mostly when they were having a conversation. That didn't really caught my attention. For a first movie, for the introduction i liked it. If it was anything else though, then i wouldn't really like it that much. But as it stands, an 8 is what it gets. Boukoku no Akito worth watching? It was just announced that your favourite manga, be it Ajin or Berserk, is getting animated! There's one catch: it's going to be CG. But don't worry, we're here to help you feel better about this traumatic news and guide you through the steps to recovery and acceptance.